In my mind, there is no chore worse than spot cleaning my carpets. The carpets in this house are especially light, and thus, they inevitably get various spots on them throughout the week. These spots drive me crazy, but in order to maintain sanity, I limit my cleaning of them to once a week when I vacuum. In the meantime, I content myself with thinking bad thoughts about them and giving them the “stink eye” whenever I pass. That way, once vacuuming and spot cleaning day comes, I am usually more than ready to take them out. Each week, there are inevitably one or two spots that drive me especially crazy, perhaps because of their location or their darkness. I tend to fixate on those big spots; whenever I pass them, I think, “Oh, I can’t wait to get that spot out!” A funny thing happens, though, on spot cleaning day. I come marching up to my spotty enemy, armed with Spot Shot (very aptly named) and a clean, damp washcloth. And then, I annihilate that spot, much to my own satisfaction. I bask in the triumph, but only for a second…because now that the offending spot is eliminated, I see a smaller spot nearby, a spot that went unnoticed while Big Daddy was alive. Hmph! I promptly take out spot #2. But oh no! Now that #2 is gone, a cluster of five smaller spots comes into focus, a little group that would have never bothered me while the others were there. In fact, now that I’m down at carpet level, I see all kinds of spots, and–even more alarmingly–there appear to be several swaths of light gray that I have successfully ignored until now. Confronted with this horror, I tend to then fly into a spot-killing frenzy, zapping and scrubbing spots until I finally give up and admit to myself that I need to borrow or rent a carpet cleaning machine. And then I realize that will probably involve phone calls (ugh) and money changing hands, and it all seems too hard, and I never do it. I repeat this process every week. It sounds lovely, doesn’t it? Honestly, I think part of the reason that this futile, spot-cleaning cycle comes so naturally to me is that for years, I tended to treat my sin the same way. I would identify a particularly egregious sinful habit that was bothering me, and then I would launch a self-control campaign against it. With focused effort and willpower, I was often moderately successful at eliminating this sin from my life–at least for awhile. The only problem was that once that sin was removed (pushed to the back burner, really), I would notice another sin that needed attention. And then another. All manner of sins would come springing into view once I started focusing on my shortcomings, and after a season of sin-zapping, I would find myself exhausted and defeated. In truth, my approach to sinfulness tended to mirror that of Benjamin Franklin. Of course, Franklin freely admits that he was not perfect at the end of his project, although he does claim more success than I would have had, if my own track record is any indication. And honestly, I tend to chuckle when I read of Franklin’s little experiment, and to think, “Yeah, right.” Either he is being tongue-in-cheek in his autobiography, or he is deluding himself to think that this is a plan that would ever work. “I am the vine; you are the branches. If you remain in me and I in you, you will bear much fruit; apart from me you can do nothing” (John 15:5). And Paul tells us to do such seemingly impossible things as “be transformed” and “be made new.” Notice the passive tense there. Clearly, Paul sees that another Force is at work to meet the standards that he sets in his letters. That’s part of why I don’t see the Sermon on the Mount as a list of rules anymore. While I view its fulfillment as the goal of my life, I have come to realize that only God’s Spirit, working within me, will ever meet that goal. That’s why I honestly don’t take the “spot cleaning” approach to sin these days. 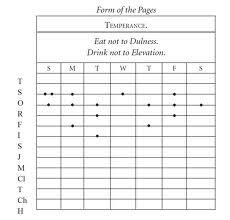 And I’m so over Ben Franklin’s charts and lists. Maybe it sounds bad, but I really don’t have a mental list of “things I need to improve” that I keep with me at all times. I’ve failed at that for too long, I guess. I’ve given up. Instead, I try to seek God with all my heart. I figure that I’m nothing without Him, and so my only job is to make sure my wagon is firmly hitched to that Star. Thus, when I get frustrated with myself and my daily failures, I don’t brainstorm ways to overcome them anymore. Instead, I just say, “God, please help me! I need your Spirit so much right now! I’m screwing everything up!” And then I just hope He comes through. That passivity used to bother me. I wanted to think of myself as a “self-made” person. I have come to see, however, that that kind of thinking is delusional. No one is self-made, and my own list of shortcomings is so long that I could never conquer it through willpower. Instead, I have to surrender my efforts, my quest for moral perfection, to another Force entirely. The funny thing is, I find that when I do turn my transformation over to God’s Spirit, I am much more effective in God’s Kingdom. My acknowledgement of my dependence on Him makes me hunger and thirst for Him more, and I am finally able to see what David was talking about with that deer imagery. Overall, it is a much more satisfying, peaceful existence. At the very least, it sure beats that infuriating spot-cleaning! On the spectrum from active to passive, how do you tend to see yourself in the process of attaining morality? I have to say, your comments are “spot on”. 🙂 The best I’ve been able to do “actively” is change some behavior…mostly temporary. I have come to see that changed behavior without a changed heart does not make me a “moral” or “holy” person. As hard as I may try, I cannot change my heart, it will have to be done for me. Then my behavior will change. “Keeping in step with the Spirit” is the activity I need. If He does the cleaning, then I’ll be truly clean. It’s daily for me. I no longer desire to be “self-made”. I’m not very good at it. But He is. Praise be to God! I love that phrase, “keeping in step with the Spirit.” Was that Paul? Or John? I’m too tired to look it up right now. It sounds like you and I have come to some of the same conclusions. This is great, Kim. I have to say that I am in the same place regarding sin. (With cleaning, however, kudos to you for bothering to mess with the spots. I would just be thinking, “Wow, somebody REALLY needs to clean that.” LOL) This is an idea that I have really latched onto lately and am passionate about. I have definitely gotten to a point with my sin where I am like, “You know what? I can’t do this.” Sure, there are things that I *should* be able to have enough willpower to prevent myself from doing–and I do try–but I always get caught in the trap that Paul describes in Romans 7; the thing that I don’t want to do is the thing that I keep on doing. When I’m in this position (which is, like, all the time) my latest response is simply humility. (I’m really trying to explain this without coming off like, “Look at me, I’m so humble.” I’m going to assume that you know what I mean.) Rather than try to play things off like they’re not really that bad (since I spent many years not even being able to admit my sin to myself), I try just to lay my wretched self at Jesus’ feet and beg for mercy. Yes, there are things we can do to try to decrease the severity and frequency of our sin, but, in general, sin is quite persistent. Even with various “hedge rules” (which is a different conversation altogether) we are not safe on our own. The thing is, the point of our Christian lives is NOT to “not sin.” The point is to be IN CHRIST. If we truly are in Christ (like you brought up with John 15), he takes care of the sin problem himself. It is not enough just to “try harder” to stop doing various “bad things.” We actually have to be changed people. Going back to the carpet analogy, we have to let Jesus totally rip up the carpet and put in hardwood. This may be a passive thing while it happens, but it is definitely not easy! In fact, it is quite painful. It is much easier just to move a chair over to cover up our spots. The active part is moving all of the furniture off of the carpet so Jesus can get to work.